A fabulous fishtail boasting beauty and femininity, the lace that adorns this dress reflects tradition, while the plunge neckline resembles sensuality. 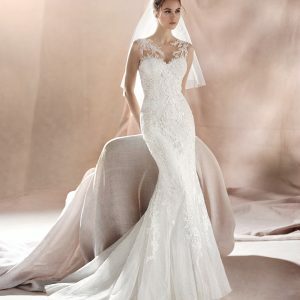 The detail of the back of Butterfly Rose is impressive, the folds across the bottom give the figure a great shape and the daring open back makes this wedding gown very unique. Finishing touches include concealed zip and button fastening. Sample gown shown in ivory size 14 in lovely condition.